Even though I recently turned sixty and have taught at colleges and conservatories, when I hear the words “back to school,” the image that springs to mind is of my teenage self as a Juilliard student in the 1970s. If I ask that self what my main educational breakthrough from those years was, the answer surprises me: discovering what actors learn. Actors study their own emotions. In 1972, a drama student told me she was jealous of us music students. Why? Because an out-of-work musician can still make music at home. But what should out-of-work actors do, recite lines from Ibsen to themselves while they set the table? This led to a discussion of what musicians and actors learn, and suddenly I became jealous. Yes, just as musicians learn the techniques of playing an instrument, actors learn the techniques of speech and movement, but actors also explore their emotions systematically as part of technique. Musicians may bring great passion to their playing, and teachers or coaches may say, “play it again but this time with feeling,” but what feeling, and whose — the composer’s or the performer’s — and how do you channel the feeling if you are not in the mood? We all know this scenario: a violinist plays a piece perfectly in tune, with clear phrasing, precisely as marked; the dynamics and articulations are exactly what is on the page and the tempo is perfect according to the metronome mark. But it is neither convincing nor artistic. What if an actor spoke lines with excellent diction, good timing, with an appropriate facial expression, and even with vocal inflection that matched the character’s mood, and yet the performance was unconvincing? It would be unacceptable because the audience must be convinced. They don’t want to see the acting through the character. Motivation is a fundamental aspect of an actor’s craft. By playing theater games about motivation with music students, the concept itself is illuminated and may well inspire introspection when it matters. In a workshop I led many years ago, a young violinist played a solo Bach movement extremely well, but that deeper something was not present. The class knew it. Using a theater-game approach to the problem, I asked the student to imagine that she was an international spy whose “cover” was that of a traveling violinist. The music she played was actually code for a life-and-death message that only certain other agents could understand. When she played this Bach movement on stage, one person in the audience would interpret the code, and then make a phone call that would ultimately save the lives of some political prisoners. With that suggestion, the young violinist became thoughtful and serious. After a long moment of reflection, she played it again. It was nearly the same but in a crucial way it was far superior. It was artistically fulfilling; it was profound. What had that suggestion done for her playing? The class discussed what had happened. The first time she played, her audience sensed her ego on display: she was proud of her playing; she used the music to prove her competency on the instrument; she was outside the music. As a spy who could save lives – and because she took the acting challenge seriously – she no longer thought of herself, but rather of the life-saving message encoded in the music, a message that had to be communicated with clarity for a higher purpose than showing off her technique. I then asked the class: is there a message encoded in the music? Is it possible that others might understand the music’s meaning when it is played so as to project that message? Might music save lives? The answer to all of those questions is yes. We played a theater game that changed the focus of the player’s attention. The game was about the intrinsic meaning of the music, which speaks in its own untranslatable language, a kind of code we musicians understand on its own terms. The theater game opened the door to emotional authenticity. That’s performance. What about composition? Studying octatonicism, serialism, world music, polyrhythms, counterpoint, extended harmonic techniques, Carnatic rhythm, jazz harmony, computer music, or set theory opens a world of ideas for a young composer, and knowledge of techniques is absolutely necessary. But without the authentic connection to one’s inner life, all these techniques serve no meaningful purpose. That message encoded in the music we spoke of must be there. How to find it? The composer must remember to dream before thinking. To dream is to allow the flow of ideas–uncensored and unsolicited–to appear in the mind, seemingly of their own accord. Where do these sonic dreams come from? It is a mix of memory and imagination. A useful sonic dream is emotionally and viscerally intense. Select a good one from among the various sonic images and begin to think. To think is to use some of those compositional techniques to explore the idea, to extend it and communicate it, to encode it. It’s back to school time, an opportunity to try something new; perhaps theater games. Let’s encourage our students to feel, to dream, and help them get beyond the page. Featured image: Amp. By Juan Di Nella. CC0 via Unsplash. An internationally renowned composer whose works have been performed by the Washington National Opera, the Metropolitan Opera Guild, Yo-Yo Ma, Itzhak Perlman, and others, Bruce Adolphe is resident lecturer and director of family concerts for The Chamber Music Society of Lincoln Center, creative director of The Learning Maestros, creator of "piano puzzlers" on public radio, and composer-in-residence at the Brain and Creativity Institute at USC. 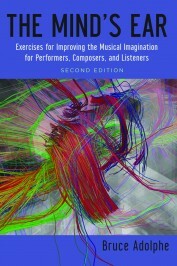 He is the author of The Mind's Ear: Exercises for Improving the Musical Imagination for Performers, Composers, and Listeners.